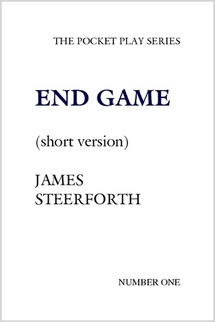 This ultrashort play by James Steerforth makes use of certain themes in Samuel Beckett’s well-known play ‘Fin de partie’ (1956), the English title of which is Endgame, for its own, hopefully somewhat amusing purposes. The Pocket Play Series No. 1. 2007, paperback, 8 pages, $9.34, $5.00 (download). Published with Lulu. Can be ordered directly from the publisher.